While credit cards cannot be used to directly pay income taxes, a few cards provide tax facilities that allow you to earn rewards on your payment. While a processing fee usually offsets these rewards, paying through a tax facility allows you to ‘buy’ miles at a discount. Below, we’ve reviewed the best credit cards for income tax payments in Singapore, so you can see which may be the right fit for you. Standard Chartered Visa Infinite Card is not only the absolute best option on the market for paying income taxes, it also offers exceptional rewards rates and travel perks. Cardholders earn a market-leading 3 miles per S$1 overseas, 1.4 miles locally, and receive 35,000 welcome miles (worth S$350). Privileges include 6 free lounge visits/year, a free yacht hire, free travel insurance, Hertz Asia privileges, discounted green fees and more. In terms of paying income taxes, SC Visa Infinite stands out from all alternatives. Cardholders (both principal and supplementary) earn some of the highest rewards rates for tax payments on the market–those with at least S$2,000/month spend earn 1.4 miles per S$1, and those with spend below earn 1 mile per S$1. The bank’s tax facility then debits the amount of your tax payment to your card and credits this amount to your bank account. You are then responsible for arranging payment with IRAS, and must pay off the credit card charge by the next statement month. Paying income taxes through a credit card incurs a processing fee–in this case, 1.6% of your total tax amount. This fee rate is higher than the rewards rate offered, so essentially, paying taxes through your card is a way of ‘buying’ miles for a cheap price. For SC Visa Infinite Card, tax payment allows you to buy at the rate of 1 mile for 1.14 cents (1.60 cents for lower spenders). This is the best ‘buy rate’ on the market. In addition, if you use rewards to book a business class ticket, 1 mile’s redemption worth is 4.40 cents, on average. This means by paying your income taxes, you’re buying miles at a deep discount. Finally, SC Visa Infinite Card stands out because cardholders with an SC banking account can also earn rewards on fixed deposits, investments, savings accounts, mortgage loans, and more. Overall, the benefits of SC Visa Infinite Card considerably validate it’s admittedly high S$588.5 fee. Ultimately, if you want elite perks, top rates, and the chance to buy miles at a discount, SC Visa Infinite Card is an excellent option for you. HSBC Revolution Card is the best card for income tax payments if you're a local, social spender and often make purchases online. Cardholders earn 2 miles per S$1 on local dining, entertainment, and online spend–which includes everything from travel bookings to online bill-pay. There’s no minimum spend requirement and no earnings cap, so you’ll begin earning right away and without limits. In terms of taxes, cardholders have access to HSBC’s tax facility. Principal and supplementary cardholders can choose between 2 options: pay their full tax amount in a lump sum, or coordinate HSBC payments to align with GIRO payments across 12 months. There’s a processing fee of 0.7% on the total tax amount, and the payment earns 0.4 miles per S$1. This translates to a ‘buy rate’ of 1 mile for 1.75 cents. While this is higher than the value of 1 mile redeemed for an economy ticket (1.15 cents), it’s considerably lower than the average redemption rate for business (4.40 cents) or first class (8.00 cents). While HSBC offers one of the only options to coordinate monthly payments with GIRO instalments, it also has a generally higher ‘buy rate’ than alternatives. However, it’s a great card for those with high spend in its select categories, and it even offers a fee waiver with just S$12,500 annual spend. HSBC Visa Infinite Card is not just a great option for airport perks, it also offers one of the highest rewards rates for income tax payments. Cardholders earn 1 mile per S$1 locally and 2 miles overseas during their first year; if they spend S$50,000 annually, they’ll subsequently earn 1.25 miles per S$1 locally and 2.25 miles overseas. This local rate applies to cardholders’ income tax payment. Considering the 1.5% processing fee for using HSBC’s tax facility, this translates to a ‘buy rate’ of 1.50 cents per mile for 1st year spenders, and 1.20 cents per mile for subsequent higher spenders. Again, these costs are just a fraction of the actual value of miles redeemed for business or 1st class air tickets. Cardholders also benefit from great airport perks. Such benefits include expedited immigration clearance, unlimited lounge access, free limo transfers, and travel insurance. While there’s a S$650 fee (S$488 for HSBC Premier customers), the rewards rates, perks, and discounted miles rate (through tax payment) make HSBC Visa Infinite Card a great option for high-spending, frequent travellers. If you’re a frequent traveller seeking luxury perks–without having to pay a massive annual fee–you may be interested in DBS Altitude Visa Card. Cardholders earn 1.2 miles per S$1 locally, 2 miles overseas, and 3 miles for online travel bookings. In addition, they receive 2 free lounge visits/year, free travel insurance, golfing privileges throughout SE Asia and more. While many cards with such perks charge sizeable fees, DBS Altitude Cardholders are exempt from the S$192.6 fee with just S$25,000 annual spend. In addition to its affordability, DBS also offers rewards on income tax payments. Cardholders receive 1.2 miles per S$1 spend on their income tax, which is paid off through DBS’s My Preferred Payment Plan for Income Tax Payments. Unlike other cards, which require repayment in one lump sum, or that coordinate instalments to align with GIRO monthly payments, DBS’s plan allows cardholders to pay DBS back in 0% interest instalments over up to 12 months, rather than paying back the entire sum in the next card statement. This instalment plan has a 3% processing fee, however, which is higher than any other tax facility’s. At this rate, paying taxes through DBS Altitude Card offers a ‘buy rate’ of 2.50 cents per mile. While this is notably more expensive than buy rates with alternative cards, it’s still a discount of nearly 50% on a mile’s redemption value for business class tickets. Therefore, if you tend to fly business or 1st class and want a great travel card with a fee-waiver, DBS Altitude Card could be an excellent option for you. Below, we've prepared a summary of our picks for the best credit cards for income tax payments in 2019. 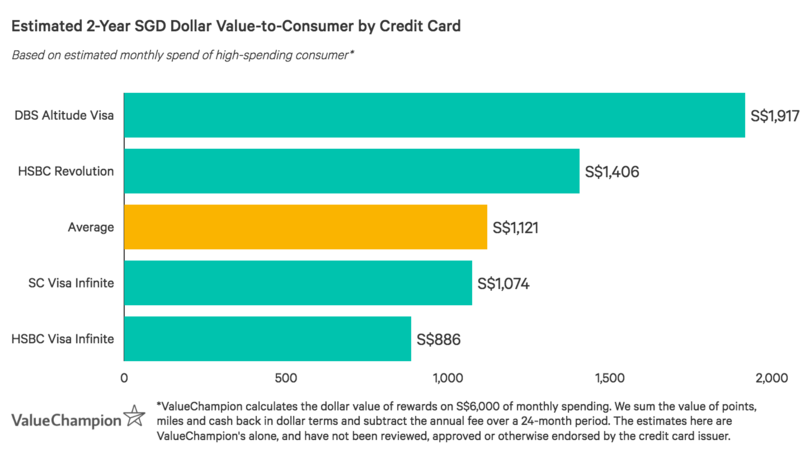 The graph below represents the approximate value-to-consumer (in SGD) of the best credit cards for income tax payments in Singapore. Dollar values are calculated based on approximate rewards earned with a S$6,000 monthly spend for 2 years. This number varies, however, depending on individual spending habits.